Time of Origin: Avalon, the kingdom of Elbyn, approximately 30th century. History: Gramling is a very distinctive foe in The Doctor's history, as he was essentially a sorcerer, although the origin of his powers was technically technological rather than natural magic. Born on the distant planet Elbyon, Gramling was a descendant of a human crew who crash-landed on the planet centuries in the past, the ship being disabled by the nanotechnological units that had been created by the alien race who previously inhabited the planet. The nanites were capable of granting the wishes and obeying the will of anyone who could control them, but since they were never designed for humans to use, it required a significant amount of effort for humans to use the nanites, while other technology wouldn't work on the planet as the nanites destroyed all machinery to prevent the resulting electromagnetic energy interfering with their own systems. The alien race who had once lived on Elbyon had exhausted most of the system's power when changing a nearby star into a nebula, the race regressing back to a more primitive society known as the celphie as the nanite system repaired itself before the humans arrived. Although the world that resulted as the crew learned how to use the nanites to manipulate their environment originally created Gods based on the unconscious belief of the colonists, the subsequent conflict between the 'Gods' forced the colony leader to use Merlin's Helm - a 'master control' for the system - to erase all knowledge of what had happened. The resulting society that developed after this disaster was based on Earth mythology and magic - the celphie simply becoming part of the minor creatures that inhabited this world, such as winged monkeys and dragons -, their mythology telling them that Merlin's 'skyboat' brought Arthur to rest on Avalon eight centuries ago. Eight centuries after the original crash, Gramling was born, going on to become a powerful 'sorcerer', although he still sought more power for himself so that he could transform Avalon into the paradise that he envisioned. Whether he created the situation or simply took advantage of it, Gramling's chance came when his apprentice, Dhal, moved on to become the apprentice of the Royal Wizard, Dahl subsequently killing the wizard in a duel and demanding the position for himself. With the court unable to conclusively prove Dahl's role in the Court Wizard's death, they couldn't dismiss his request completely, but giving him the title meant giving him access to various magical artefacts and books, appointing someone else to the title would only force the new wizard to face Dhal themselves, and few magic-users could agree on anything long enough to band together to defeat Dhal as a group. 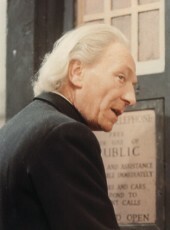 With Gramling now allied with the court as they contemplated their next move, the stalement between Dhal and the royals continued until the arrival of the First Doctor and his companions, who were brought to the castle after they helped to rescue a knight from a dragon (The TARDIS's automatic defences prevented them from entering the ship as the nanites they had been exposed to would have destroyed it). Although The Doctor refused to believe in magic even after Gramling's demonstrations, he was left with no choice but to get involved in the world's affairs after Susan was captured in a raid by Dhal's forces to learn more about the new arrivals. Agreeing to help Gramling and his 'allies' against Dhal, The Doctor and Ian joined a quest to recover Merlin's Helm based on information Gramling had allegedly recently discovered - now regarded as a powerful artefact that was meant to grant the wearer access to unlimited magic for the short time before the power burnt out their minds, only available for use after certain rituals were performed by the king to grant the user permission to access its power - while Barbara remained at the castle to research Avalon's history. Although they encountered a crashed lander from an Earth fleet that had been sent to investigate recent disappearances in this sector of space - confirming their temporal location for The Doctor - it wasn't until they found the Helm at the remnants of the ship that brought the humans to Avalon that The Doctor learned that the expedition had come here looking for a weapon supposedly capable of destroying a star to aid the collapsing Earth empire. Meanwhile, Barbara's research exposed various anomalies in Avalon's history, including the lack of religion and the absence of details about Merlin's Helm in the library, although Gramling claimed that he had destroyed the books about the Helm after reading them. Before Barbara could pursue this issue further, she was lured out of the castle by a glamour cast by Dhal that made her believe that she had seen Susan, becoming lost in the woods around the fortress. Fortunately, Susan was able to escape Dhal's fortress by using magic to create a rope-ladder, while Barbara discovered and revived Anni Glassfeather, a powerful witch who had been placed in an enchanted sleep to stop her interfering with Dahl's plans. Having used a microscope salvaged from the wreckage of the ship to deduce the presence of the nanites while the expedition leader's journal filled in the rest of the pieces of the puzzle, The Doctor accepted training from Odolye the leprechaun so that he could learn how to use magic - his ring with the blue stone serving as his 'wand' - for the now-inevitable duel that awaited them. Although Susan and Melissa were able to escape Dahl's fortress with the timely aid of Barbara and Anni - as well as Susan working out how to master a few simple spells to summon insects and turn hair into rope - Dahl continued to pursue his plans even after the Earth fleet in orbit destroyed his fortress by dropping a large metal rod through the fortress. As The Doctor's expedition returned to the castle with Merlin's Helm, Gramling prepared a ritual that would allow him to control its power, only for Dahl to appear just as the preparations were completed, revealing that he had been controlling Gramling for years in order to gain access to the Helm. However, Gramling's true agenda was revealed when he used the power of the Helm to switch minds with Dahl, confirming that he had resisted Dahl's attempt to control his mind from the beginning. Although he expressed regret, he confirmed that he now intended to use Susan and Melissa - subtly influenced by Dahl's magic - to create the perfect world that he had long dreamed of regardless of the sacrifices that he would have to make as others died while using the Helm. Although Dahl soon died in Gramling's old body, The Doctor, Odoyle and Anni subsequently attacked Gramling with all their available magic, the sheer force of the attack drawing Gramling's attention away from the Earth forces long enough for Ian to take the Helm from Gramling's old body. Although Odoyle was killed in the struggle, The Doctor provoked Gramling into focusing on him, suggesting that some of Dhal remained in his new form due to Gramling's desire to avenge The Doctor's minor mockery of him in their first meeting being at odds with his allegedly noble intentions, allowing him to destroy Gramling with a concentrated blast of magic. With the conflict concluded, Ian returned the Helm to the celphie - The Doctor having deduced their true nature as the only race not originating from Earth mythology - restoring them to a sense of self. Once again aware of their pasts, they destroyed the nanobot network, ending Avalon's magic and their own existences, restoring peace to their old world and giving them the rest they had sought. With the world now safe and free to develop on its own limitations, The Doctor and his companions departed, the Earth fleet agreeing to help Avalon make diplomatic contact with Earth and survive the loss of their magic after being humbled by the celphies' sacrifice, suggesting that Gramling's goal of bringing peace to Avalon through the Helm would succeed, even if not in the manner he envisioned.